Most motorcycle books fall into a catagory filled with similar books but this book is in a catagory by itself. 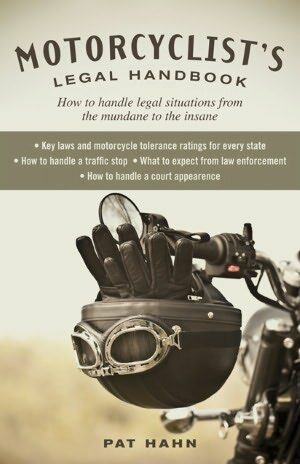 The Motorcyclist’s Legal Handbook by Pat Hahn is aimed at keeping your driving record clean. I’m not sure what I was expecting but I was expecting something a little more in depth. This is pretty simple, too simple: don’t break the law, keep a low profile and you shouldn’t have a problem with excessive points on your drivers license. If you do get stopped or receive a ticket, fight it. Pat Hahn gives you good advice on how to handle being stopped by the police and what to do about getting a ticket. The chapter where Pat explains how to fight a ticket was the most interesting. I’m the type of person who just pays the fine because I did break the law and I got caught. Pat has a point that traffic police have a pretty easy gig nailing speeders. At any given time a number of drivers all around us are speeding and somehow you get singled out and receive a ticket for going what you may feel was not excessive. There are so many laws you are likely to be breaking some law and the police officer can probably ticket you for something no matter what. Most people like me usually pay the fine without a fight thus making this traffic ticketing business much more profitable for the government than sending police out to track down hard criminals. Like jury duty, Pat feels it is our American duty to exercise our right to argue against the ticket. Pat has good strategies on how to pay the fine but not receive points on your driving record which leads to higher insurance costs. This advice alone is worth more than the cost of the book. This is a 240 page book and half the book is a state by state referance to the motorcycle related laws. I like the quality of the gloss coated paper and great pictures at the beginning of each chapter. Nice photography! I prefer my books to use a serif faced type for the text to make it more readable where the letters flow from one to another. With the exception of the sub title “How to handle legal situations from the mundane to the insane” the entire book headlines, text and graphs are in a sans serif font. I give the publishers a demerit for that! Yes, I know my blog is guilty also. Sorry! Pat is good at research and making cool graphs but I wish this book covered more legal situations as the sub title promised. Here is another book review I did on a different Pat Hahn book in 2008, click here.